Pete Rose appears at an autograph signing event last month in Las Vegas. Baseball Commissioner Rob Manfred rejected Rose's plea for reinstatement, citing Rose's continued gambling and evidence that he bet on games when he was playing for the Cincinnati Reds. Without reinstatement, Rose can't be elected to the Hall of Fame. 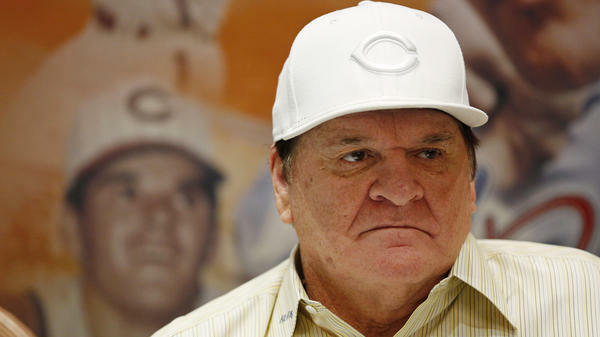 We start 2016 with a command: that the subject of Pete Rose and the Hall of Fame is over, finis, kaput forever and ever. As sure as we will no longer discuss whether Lindsey Graham or George Pataki can be president. The new commissioner has been even more adamant in dismissing Rose's pleadings, so it doesn't matter how passionately you feel — it is a dead issue. There. But OK, now that we have that settled, there's bound to be more attention devoted to the candidacies of the accused steroid users. Should they get in the Hall of Fame? Especially among those who worship at the altar of statistics, there is the argument that, well, so many players were using that the cheaters just proved that they were better than the other cheaters. Of course, this still cheats all the players who didn't cheat, but since nobody knows the accurate steroid census, the argument persists. Baseball's Hall of Fame announces its 2016 inductions later today. Outfielder Ken Griffey Jr., who played most of his career in Seattle, looks to be the only shoe-in this year. That got commentator Frank Deford thinking about who else should or should not get in. FRANK DEFORD, BYLINE: OK, we start 2016 with a command that the subject of Pete Rose and the hall of fame is over, finis, kaput forever and ever, as sure as we will no longer discuss whether Lindsey Graham or George Pataki can be president. The new commissioner has been even more adamant in dismissing Rose's pleadings, so it doesn't matter how passionately you feel. It is a dead issue - there. But OK, now that we have that settled, there's bound to be more attention devoted to the candidacies of the accused steroid users. Should they get into the Hall of Fame? Especially among those who worship at the altar of statistics, there is the argument that, well, so many players were using that the cheaters just proved that they were better than the other cheaters. Of course, this still cheats all the players who didn't cheat. But since nobody knows the accurate steroid census, the argument persists. More specifically is the contention that Barry Bonds and Roger Clemens ought to have special dispensation because they already possessed the Hall of Fame credentials before all reasonable evidence suggests that they starting juicing. But just as sometimes there is a cap conundrum in which team's hat should a Hall of Famer be depicted on his plaque if he played for more than one team, this would create the curious dilemma whether Bonds' or Clemens' statistics on their plaques should include their total career numbers or just those when they were presumably as clean as a whistle. Of course, by this standard, we could get that great American general, Benedict Arnold, a spot in the honor roll of Noble Americans, before he had that little change of heart. I've always thought that it was unfortunate that the Hall of Fame was named thusly. I mean, the ball name - fame - suggests that it's just a repository for celebrities, like a tacky sidewalk in Hollywood with all the stars implanted on it. Actually, the baseball hall took its name from the Hall of Fame for Great Americans, which was created at New York University in 1900. At that time, the word fame also had the larger common meaning of renowned, which had a more distinguished definition that related to honor. And don't forget that integrity and character are indeed included in that catalog of properties that candidates to Cooperstown are supposed to be judged on. At the very least, it seems to me, if Bonds and Clemens are ever to be considered, they have to be interrogated by the commissioner, no less than Pete Rose has been. Uh oh, wait a minute. Wait a minute. Didn't somebody wise just say we weren't supposed to ever again mention Pete Rose and the Hall of Fame in the same breath? MONTAGNE: Commentator Frank Deford. He joins us here most Wednesdays. Transcript provided by NPR, Copyright NPR.